Windows Terminal Ware. WTware licensing terms. License generator. Concurrent licenses. 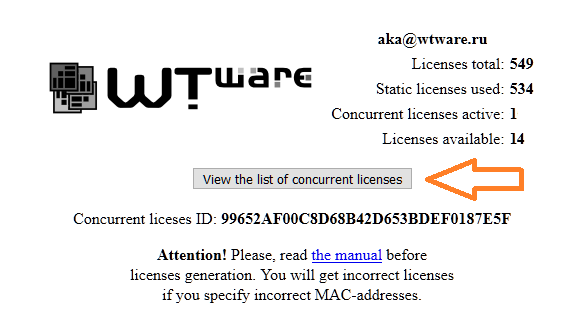 WTware software licensing terms. Concurrent and static licenses. 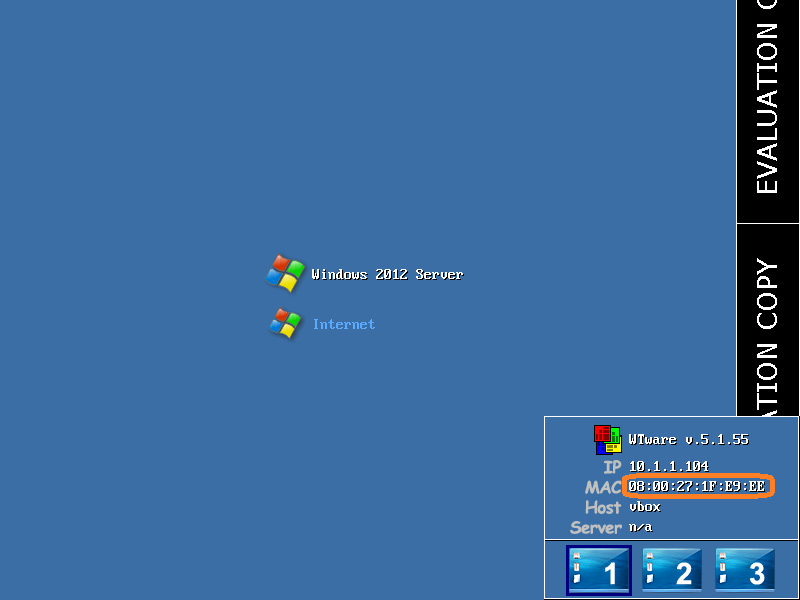 WTware software without license works in testing mode. In this mode WTware draws banner with the words "evaluation copy" along the right monitor side. License removes this banner from the screen. There are no other technical limitations in testing mode. All features work exactly the same as they will work with license. Nobody has the right to use WTware without license, obtained from WTware developer company or authorized partners. There are two ways of licensing: static licenses and concurrent licenses. 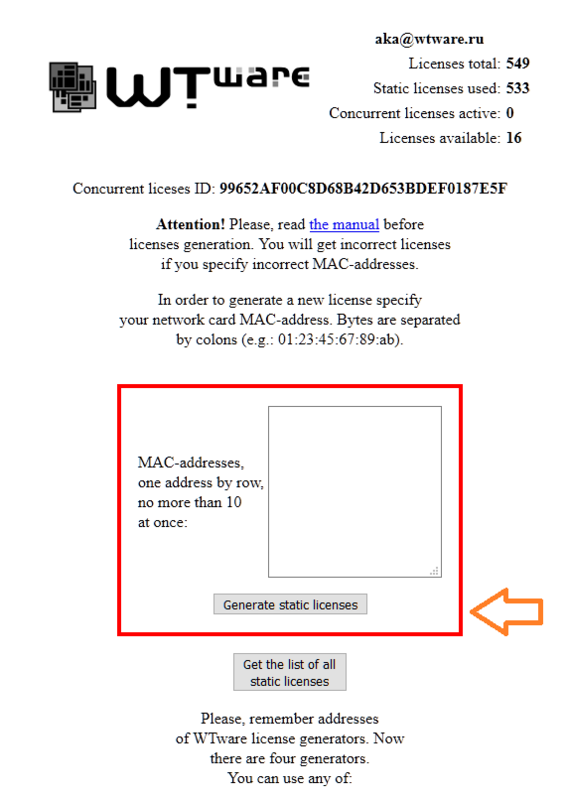 Enter MAC-address in license generator. License generator address and login details you'll receive by e-mail after purchase. Press the button "Generate static licenses" and generator will calculate license code. Static license is bound to terminal network card MAC-address forever. Please, be very attentive specifying MAC-address. In case of mistake you'll receive incorrect license. Every issue of license restoration in case of terminal network card failure is considered individually. During boot terminal connects to Internet and sends request to WTware activation servers for obtaining the license for this terminal. Concurrent license is not stored anywhere, it is valid until terminal reboot. If during boot terminal fails to connect to Internet, terminal won't be able to obtain license and WTware will draw banner "evaluation copy" on the screen. 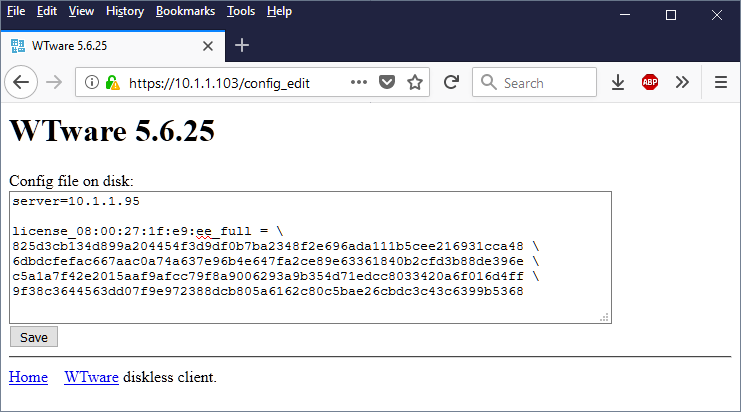 If terminal finds in configuration CLID parameter and doesn't find static license, it requests DNS for servers cl.wtware.com IP-addresses. There are several servers, terminal attempts to connect to all of them. 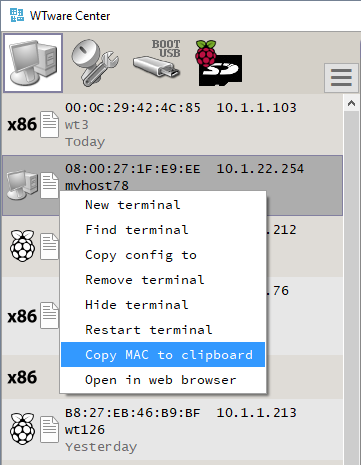 Terminal connects to the first responding server by TCP, 80 port. It sends one HTTP-request. In HTTP-request terminal sends to server concurrent licenses ID, specified in it's confguration, and it's MAC-address. 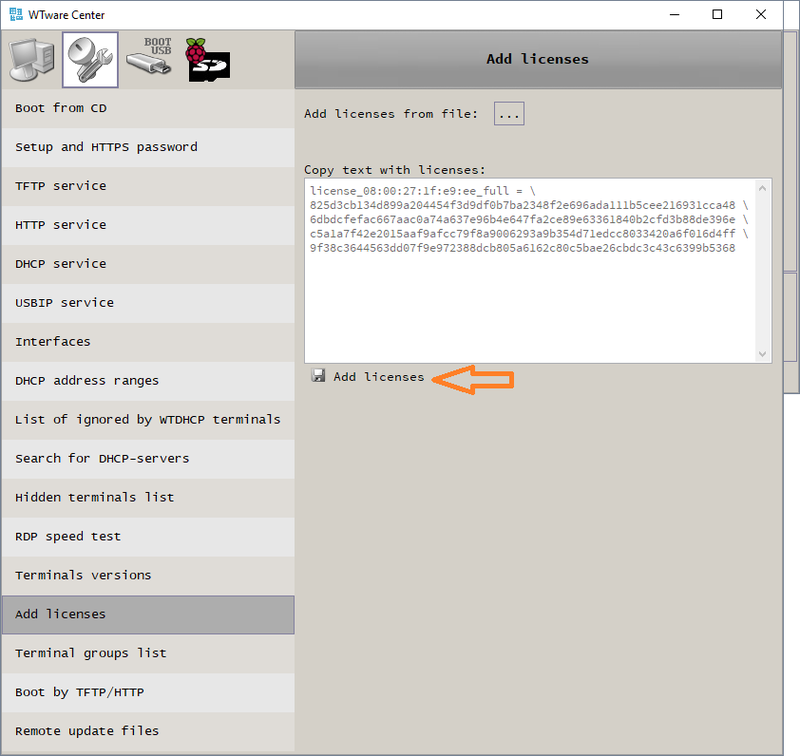 Terminal sends no other information to WTware servers. All sent data is thoroughly encrypted. 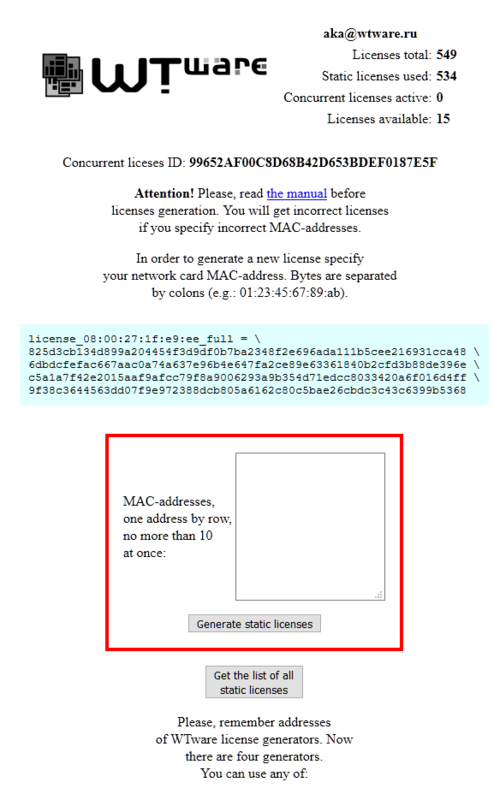 Concurrent license is bound to terminal MAC-address for several days. If you have 10 licenses, 10 your terminals may obtain concurrent licenses at the same time. When some terminal goes out of service and for several days sends no requests to generator, then generator releases license, issued for this terminal. 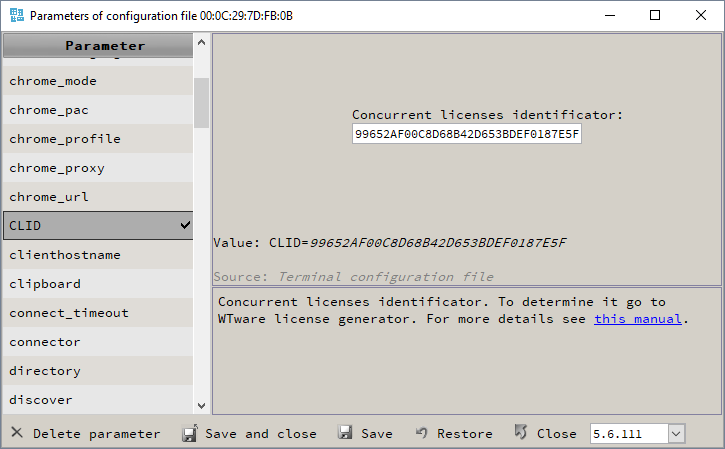 Then another terminal with specified concurrent licenses ID in it's configuration may obtain this released license. Any time you may stop using concurrent licenses and use static licenses. If for several days terminal doesn't ask generator for concurrent license, you may release this concurrent license on generator and generate static license for any needed MAC-address. There's no way to tranfer static license to concurrent. Static license is bound to computer network card MAC-address forever. Static license life time is terminal life time. Every issue of license restoration in case of terminal network card failure is considered individually.